Sorry, this book is currently out of stock. Email info@butlerbooks.com to learn more. For over a quarter-century, popular television host and producer Dave Shuffett has traveled thousands of miles across the Commonwealth of Kentucky, interviewing people and photographing places that showcase what is unique and extraordinary about the beloved Bluegrass State. Dave's keen eye as a photographer and his seasoned skills as an interviewer and storyteller have earned him nine Emmy Award nominations along the way, as well as a national Telly Award. For 25 years, Dave and his popular canine co-hosts have shared their travels and adventures with television viewers, exposing them to the fantastic places and colorful characters he has discovered in every county of Kentucky. In his first book, My Kentucky Life, Dave shares over 100 pages of his favorite photographs and essays from those travels, opening our eyes and our hearts to the rich heritage, fascinating people, colorful culture and pure natural beauty of the Commonwealth. As Dave so often says, "No need to book an expensive vacation ... Just explore the 'paradise of Kentucky' that is just a county away or, at most, a day's drive." Join Dave on this unforgettable adventure into his "Kentucky life." Dave Shuffett has been a popular television host and producer on both the regional and national levels for 25 years. From 1989 to 1995, he served as host and producer of the long-running Kentucky Department of Fish and Wildlife television series, "Kentucky Afield." Shuffett then took his skills to the national level as owner and host of "Outdoors with Dave Shuffett," airing on broadcast stations and The Outdoor Channel. After three years of crisscrossing America, he returned home in 1999 to become host and segment producer for Kentucky Educational Television's (KET) weekly series, "Kentucky Life," replacing well-known storyteller, writer, and television host Byron Crawford. Shuffett is still at the helm of the show, telling stories of the people and places that make Kentucky such a wonderful place. He is also co-host of the popular new KET series "Kentucky Collectibles." Shuffett is a nine-time Emmy Award nominee for on-camera performance and television producing and, in 2005, was the winner of a national Telly Award. He is a popular public speaker, integrating humor with stories of his adventures. 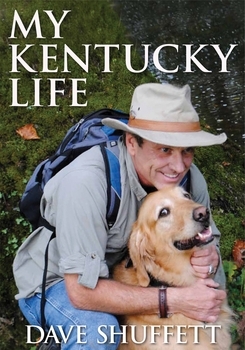 He is also the bi-monthly "Great Outdoors" columnist and photographer for Kentucky Living magazine. Shuffett was born and raised in south central Kentucky in the small town of Greensburg, county seat of Green County. He attended Murray State University and graduated with a bachelor's degree in communications in 1982. He has two children, Will and Miranda, who grew up watching their dad on TV and accompanying him on many adventures. "There really is only one Kentucky, and each of the Commonwealth's 120 counties is unique and extraordinary. Dave Shuffett's book, My Kentucky Life, introduces readers to some of our state's most treasured and unforgettable people and places." "Dave Shuffett has seen Kentucky from all sides — through many cameras — and now, in this remarkable collection of photographs and essays, we glimpse many of his most memorable faces, places and moments." "I have learned more about my home state of Kentucky than I ever thought possible through Dave Shuffett's travels — even more now, through his beautiful photographs and stories."